I had been on the lookout for a REAL dolls house for Lara. 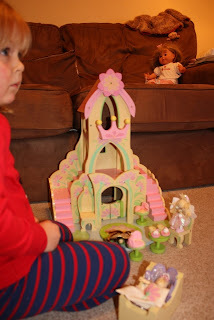 We come across a fair few plastic or 'play' dolls houses in our blogging travels but I really wanted something a little more grown up for her, something that would really stretch her imagination and role play skills and keep her interested for a year or more. Then, as if the dollshouse fairies had been watching me, www.dollshouses.co.uk got in contact and asked if we would like to try out their Fairy Tower dollshouse which is part of their wide range of children's dolls houses. 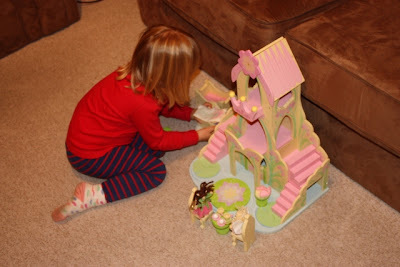 dollshouses.co.uk sell wooden dolls houses and thats what makes them stand out for me. This Fairy Tower looks and feels like a really good quality item that will last both Lara and Holly many years to come. Building the house was pretty painless and it now feels very strong. 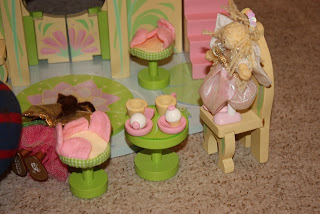 We were also sent a set of three Truth Fairy dolls to live in the house. Lara likes to tuck them into their tiny beds complete with duvet and pillow sets and place them down to sleep in the drawers under the tower! We have already had a lot of use out of this dolls house and I expect there to be hours and hours more entertainment in it. The Fairy Tower seems to capture the imagination of adults and children who come to visit. Even Lara's grandparents wanted to play! It comes with a table, two flower-shaped chairs and a small set of wooden crockery so that you can host tea parties! One of our teacups was damaged on arrival but we fixed it easily with superglue. I love the colours on the Fairy Tower - it is painted with pink flowers and water lillies. I also like the fact that there are lots of cubby holes for your child to explore with their dolls - stairwells, arches, tunnels, drawers and towers. The flower on the top of the tower whizzes round. The Fairy Tower costs just £32.99 and the set of three budkin dolls costs £12.99 which I think is a bargain compared to the big brand high street names. Both are made by wooden toy specialist, Le Toy Van. dollshouses.co.uk also sell more traditional dolls houses and accessories as well as castles, garages, arks and pirate ships!